No person should struggle with or be limited by technology to access their financial information or complete their day-to-day banking needs. Yet that isn’t always the case for millions of Americans who live with some form of disability that limits their dexterity or sight. While industry advocacy groups such as CUNA continue to fight against predatory litigation based on ambiguities within the Americans with Disabilities Act (ADA), there is an opportunity for credit unions to expand their range of assistive technology offerings, doing even more for their members with disabilities through voice assistant technology. Credit unions have always worked to provide world-class service and support to all members. Now, with advancements in voice technology such as natural language understanding, they are empowered to do more. “Voice technology can be a game changer for people living with disabilities,” says Theo Lau, FinTech innovation expert and Founder of Unconventional Ventures. Voice assistants allow members to speak naturally as they communicate what they need or request the information they are seeking, immediately benefiting those with limited dexterity or sight. Our dexterity is something many of us may take for granted. Yet simply picking up an iPhone and beginning to pinch and zoom is not something everyone can easily do. “My family has a history of arthritis which limits manual dexterity. Due to arthritis, my mom’s ability to type for long periods is limited,” said one credit union executive, who asked to remain anonymous. He is currently exploring how voice assistants can benefit his members. He went on to explain how his mother’s eyesight is also fading, and how voice assistants are helping to keep her current with technology, even though using her hands has been more difficult. “Her Amazon Alexa Show device is simple for her to talk to, she can easily video call with us to keep in touch and to more frequently see her granddaughter. Without voice control of sophisticated devices, frustration may have prevented her from being a bigger part of our lives.” This story highlights some of the many ways voice technology is aiding those with more limited dexterity. Voice technology can also benefit the visually impaired who rely on screen readers—software that attempts to communicate what is on a display via non-visual means, like text-to-speech, sound icons, or a Braille device. The visually impaired who choose to use voice-activated devices, can check their bank balances, turn on lights, play music and much more. Voice assistants are playing a bigger role in the lives of the visually impaired while providing them with new ways to interact with the world. Before you add voice to your repertoire of assistive technologies, follow these three simple steps. Take the time to consult members with disabilities to understand how they currently complete their daily banking needs. While voice-activated devices do understand natural language relatively well, the way most of us speak to voice devices has been shaped by the syntax of digital searches, so working closely with members with disabilities is vital while working on implementing voice technology, in order to ensure that the service is truly meeting members’ needs. Switching to a new channel always offers challenges, but the benefits of voice are clear, particularly for persons with disabilities, where voice offers an alternative that has the potential to better meet needs. Nevertheless, active campaigns to spread the word about the new technology, and promotion both digitally and in-branch are vital in spreading information and encouraging adoption. Campaigns with detailed instructions for adoption are also useful, as voice assistants technologies are still new to many. As with any new technology, questions of security will always arise. Most voice assistants will be used inside the home, by users of all ages, so users’ spoken pins or password protections are unlikely to be overheard. Furthermore, voice devices can use two-factor authentication, in which a secondary numeric pin is sent to a cell phone or other device, and must be verbally confirmed before an action is processed. It’s important that financial experiences are simple, convenient, and accessible to all members. 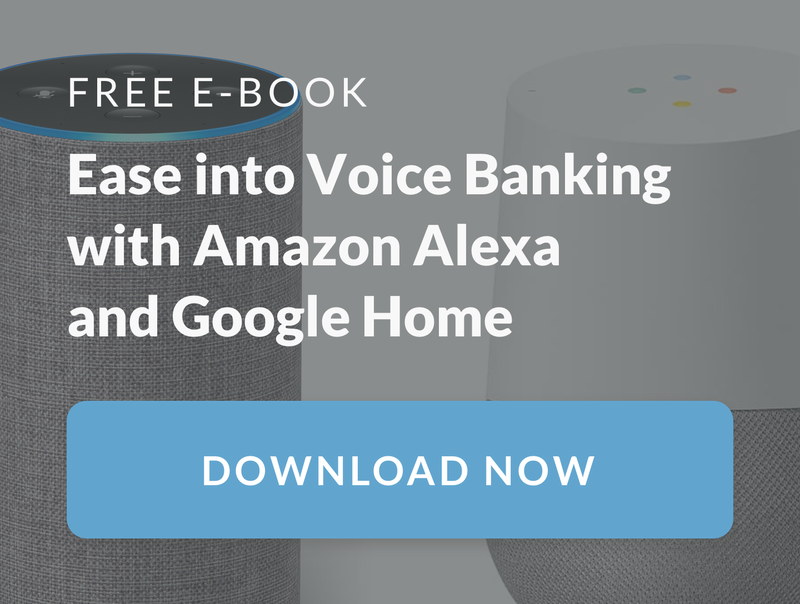 Many credit unions have take steps to offer a broader range of assistive technology options, and who advancement in voice technology and adoption of voice assistants, they are empowered to do more than ever before. This article was originally published on CUInsights.